No matter which party has held office over the last fifty years, Henry Kissinger has been in power. Henry Kissinger is having a good year. largely fits with the broad strategy behind the Obama administration’s effort over the past six years to build a global architecture of security and cooperation for the twenty-first century. Across party lines, Kissinger wields surprising influence. What makes his legacy so enduring? Prospective imperialists can turn to his authorized biographer Niall Ferguson for answers. Harvard’s specialist in restoring the devil’s reputation — having done so previously for the House of Rothschild and the British and American empires — argues that if we weigh the good (the United States winning the Cold War) against the bad (the “loss of life in strategically marginal countries”), Kissinger comes out a hero. Fortunately, those of us unwilling to perform that calculus have Greg Grandin’s Kissinger’s Shadow: The Long Reach of America’s Most Controversial Statesman. The book avoids the trap of simply enumerating Kissinger’s crimes and actually takes its subject’s worldview seriously. Rather than focus on how Kissinger plotted and manipulated to gain so much power, Grandin analyzes why he did it, revealing the ideology that underlies Kissinger’s crimes. Invariably, Kissinger is described as the quintessential realpolitik statesman. Grandin, instead, lays Kissinger bare as a radical relativist, a postmodernist avant la lettre, an almost romantic believer in the ability to create one’s own truth. It was Kissinger’s relativist philosophy of history, Grandin argues, which has been his “chief contribution to American militarism” and “restoring the imperial presidency.” The book gives this aspect of Kissinger’s thought the thorough investigation it deserves. As a Harvard graduate student, we are told, Kissinger was heavily influenced by Oswald Spengler, but replaced his pessimist determinism with a call for action, a need to seize the initiative and create one’s own facts — both as an individual and as state policy. Moral requirements, Kissinger thought, would get in the way of freedom, again on a personal and national level. In this analysis, the real world did not matter. Instead, he focused on how perceptions of reality encouraged or impeded the freedom to act. That was why secrecy became so important to him and to subsequent statesmen — think of Obama’s assassination-by-drone program. It allows them to control information and optics, thereby creating space for action. Kissinger absorbed responsibilities beyond his formal role, overseeing a “qualitative leap forward” in the imperial presidency, turning the National Security Council into the “central hub” of American foreign policy, and placing himself at the top of a pyramid of information processing, decision making, and execution — all preferably shrouded in a cloud of secrecy. That people and states had to create their own destiny was Kissinger’s main precept. But this staple of American mythology means nothing without moral substance: working hard toward a goal can serve power or counter it. Kissinger wielded it to accumulate and consolidate power. But Grandin pointedly notes that Daniel Ellsberg (the “Anti-Kissinger”) followed a similar course to a very different effect by “speaking out against the war and then leaking top-secret documents.” He took “a tremendous risk” and “changed the course of history,” perfectly following Kissinger’s philosophy to his boss’s great chagrin. 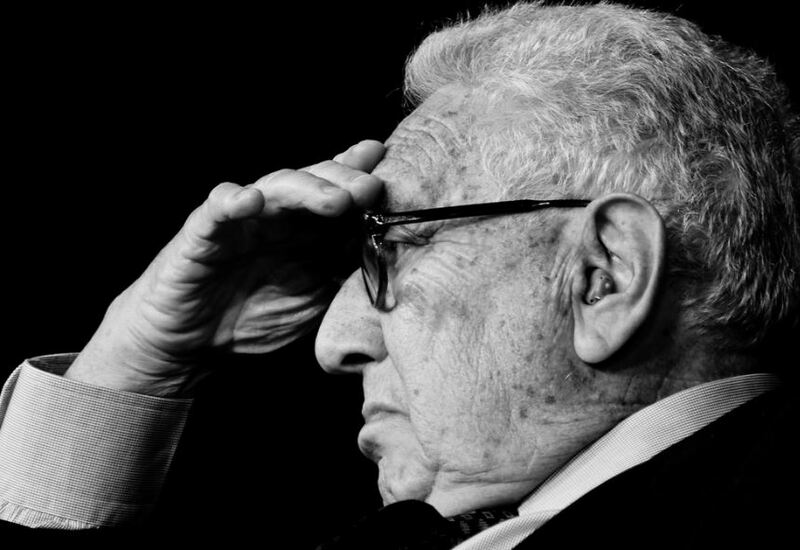 Grandin skillfully uses Kissinger to traverse the American state’s historical development. While biographies always run the risk of overstating their subject’s influence, Kissinger’s Shadow finds the balance between individual impact and structural developments. In “History as an Art,” Bertrand Russell reflected on a tendency in mid-century historical writings: they focused on structures, social forces, and collective entities rather than individuals. The idea “that individuals do not count and that those who have been regarded as heroes are only embodiments of social forces, whose work would have been done by someone else if it had not been done by them” is “most perniciously false,” Russell wrote. The infrastructure of terror in Asia, the Middle East, Africa, and Latin America — which endures today — was underpinned by his philosophy, and it continues to shape American foreign policy. As Stephen Duncombe has argued, the Right has captured the power of imagination and spectacle. The Left clings to truth-based politics, determined to burst the bubbles created by propaganda. In recent years, however, it has failed to successfully link these truths to inspirational visions for the future. “I have a dream” has been replaced by Obama’s International Advertising Awards. Instead of insurgent students besieging the status quo, we watched a presidential election be decided by public relations and self-created spectacle. Trump, in some ways, rode the long wave of perception politics, a wave that can in part be traced back to Kissinger. The president-elect of course speaks to a different audience than his forerunner did — and on some points the two couldn’t be further apart — but he mirrors the former secretary of state in his ability to brush off scandals and in his capacity to create a false reality that his audience nevertheless believes in. Perhaps the most influential argument Kissinger made to validate his war on Cambodia was the need to destroy enemy “sanctuaries.” . . . That argument was outside of the mainstream of international law in 1970, so much so it prompted Thomas Schelling’s break with Kissinger. Today, it is unquestioned. Citing a Foreign Policy article that claims denying “safe havens” was the premise for the war in Afghanistan and drone strikes in Pakistan, Yemen, and Somalia and quoting Obama’s maniacal “If you threaten America, you will find no safe haven,” Grandin convincingly shows the reach of Kissinger’s influence. International law may be by and for barbarians, but its potentially constraining features should not be cast aside so easily. Although the law generally works in favor of powerful states, it also sets — at least in theory — important limits to what states are allowed to do. In Yoram Dinstein’s standard work, War, Aggression and Self-Defence, we indeed find legal justifications for barbarism, such as the war in Afghanistan. But despite American claims, the laws governing national self-defense do not allow “purely preventive measures” against terrorist attacks and set conditions of necessity, proportionality, and immediacy. When Grandin states that the justification for destroying enemy “sanctuaries” across borders now goes “unquestioned,” he gives away way too much ground. That said, his overstatement may reflect the regrettable fact that law is tending toward accepting this principle, spurred on by recent state practice and rhetoric. Be that as it may, the fundamental changes that have taken place are still ongoing and contested. We should not concede them before the die is cast. Kissinger’s influence has indeed been “outsized,” and more worryingly, seems unlikely to subside anytime soon. The only presidential candidate who dared to oppose him was Bernie Sanders: he called Kissinger “one of the most destructive secretaries of state in the modern history of this country” and blamed him for the Khmer Rouge’s rise. And despite Clinton’s attempts to woo the elder statesman, he refused to endorse any candidate. When Trump boasted about their meeting, Kissinger put out a mild statement of disagreement, shrewdly keeping the door open for whatever new opportunities the election might bring. Mid-book, Grandin discusses how the security state depends on political amnesia. To create this “forgetfulness,” he writes, controversial policies are framed as “technical matter[s],” focusing on the “legality of the means,” rather than the goals. One could add to this an even more common tradition: analyzing controversial decisions as if they were tactical calls, which allows — up to this day — endless “dissenting” op-eds labeling the Vietnam war a “mistake” and not a crime. Similar criticisms have often been hurled at Noam Chomsky, whose tireless outpouring of facts over the decades was often deemed insufficient — or even unsophisticated — by theorists and ideologues who did not share Chomsky’s belief in people’s ability to stand up and act. “Everyone already knows,” the argument went, so providing them with information alone won’t change anything. But while it may ring true that the security state is “stronger than ever,” Snowden’s leaks, the subsequent reporting, and the uproar they caused did in fact curtail state powers. Increased awareness led people to adopt encryption software, either proactively or thanks to the corporations that felt compelled to implement it. Real juridicial and legislative victories have followed. Granted, simple knowledge of facts does not invariably spur people into action. Information alone may not be enough, but its publication is a necessary prerequisite for much that follows: critical thinking and movement building. A more central question is who has access to this knowledge. Social and economic resources limit the public’s access, and here Grandin masterfully fulfills the role of public intellectual, sifting through the primary documents to create a critical, alternative history for all of us. As in his other books, he has produced a work people can turn to when mainstream histories don’t fulfill their critical curiosity. In this vein, one can only hope Kissinger’s Shadow becomes the classic reference book that it deserves to be. Thanks to Rebecca Mignot-Mahdavi for her help on this article.